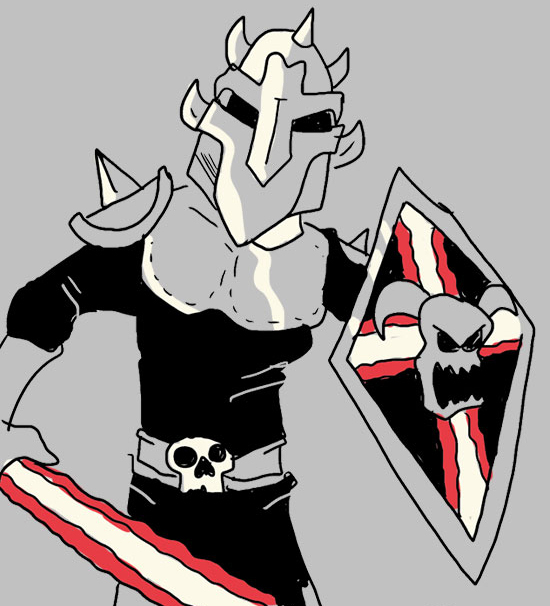 The is the debut episode of Bacon Knightâ€™s Preview Review. This week I Review the trailers from Despicable Me 2, The Look of Love, Kevin Hart: Let Me Explain, and The Lone Ranger. Which one will be the movie to see this weekend? Give a listen to find out. Iâ€™ve seen tons of movies, and since everyone says Hollywood is dead and canâ€™t come up with new ideas then that means it should be fairly easy to review movies before I see them. That is exactly what I intend to do. Sit back, relax, and listen as I pass judgment on this weeks upcoming movies based on nothing but the trailer. Anyone that has caught an episode of Bacon Live knows that here at Mr. Baconpants one of our favorite foods other than bacon is tater tots. Those yummy little puffs of potatoes remind us of our childhood and we just canâ€™t get enough of them. Sadly not a lot of restaurants feature the mighty tots on their menu but when they do they quickly become one of my favorite places to eat. 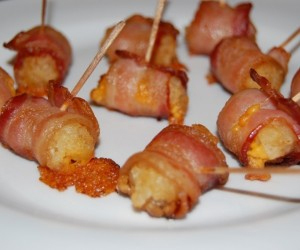 Now when you take the crispy nostalgia of tater tots and wrap them in the power of bacon you have yourself a food that will be the envy of any tailgating event. But then if you add cheese in the mix you have yourself a treat fit for the gods. Collegiate Times has a quick and easy recipe for these mouth watering poppers. Now you can be the hit at any party by showing up with a tray of these bad boys. Let me just give one pro tip that can separate the men from the boys. While making your bacon wrapped cheese filled tater tots slice a jalapeÃ±o and stick a pepper ring to each tot for an extra kick. Check out the recipe here and let us know if you have any ways of taking these tots to the next level. Remember the days when everything was a lot safer. You didnâ€™t have to lock your doors, you could actually let your kids play in the local park without worrying they might develop a crack addiction, and when your friendly neighborhood meat delivery man came he dropped off some bacon and walked away with a smile. Well those days are all over thanks to Craig A Hufford. Whoâ€™s Craig A Hufford? Heâ€™s a jerk that used his position as a trusted meat delivery man to take advantage of good steak loving people. As he made his delivery route through central Illinois he used that opportunity to find houses to burglarize. Thatâ€™s right the same man that brought people joy by delivering pounds of bacon, steak, and pork chops right to their door step was also robbing them blind when they werenâ€™t home. Luckily this thief wasnâ€™t very good at being a thief and tried to break into a home when the homeowner was still there. The very courageous home owner picked up the phone and called the cops on a man who up until that point only brought his home joy in the form of sausage. The police caught the meat delivery bandit a short time later driving away in his meat delivery truck. Now the police think he might be connected to more burglaries in neighboring counties and he has warrants out for his arrest in Florida and Michigan. 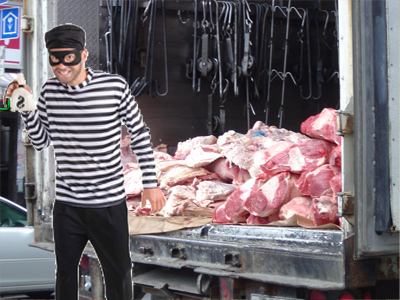 Iâ€™m glad this criminal got caught and justice will be served I just hope this doesnâ€™t hurt the home meat delivery market because there really is nothing better than waking up in the morning knowing that there soon will be a knock on your door by a man holding bacon just for you. When parents imagine their childâ€™s first words usually they think itâ€™s going to be something like â€œmammaâ€ or â€œda-dad.â€ The parents think this because they feel a child will want to vocally express how much they love their parents. Well this video has been popping up all over the web that shows at least one kid out there has their priorities straight. This little kid is just bouncing up and down, like little kids do and telling the world what they truly love, bacon! Multiple times this kid calls out for crispy pork belly but the parents just keep video taping. Mom, Dad how about you put down the camera and get that kid some bacon for godâ€™s sake. 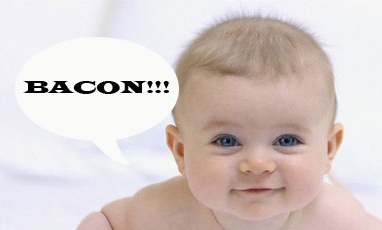 Thestate.com is making a pretty bold claim that Guanciale might actually be better than bacon. Youâ€™re probably thinking right now, â€œWhat the heck is Guanciale and how do you even pronounce that?â€ Well Iâ€™m told itâ€™s pronounced â€œgwahn-CHAY-layâ€ and it comes from the pork jowl or cheek. Now some people might be turned off by eating a little head meat but that doesnâ€™t bother me at all. I found that some of the best cuts can come from an animalâ€™s cheeks. The thing thatâ€™s turning me off is the better than bacon claim. 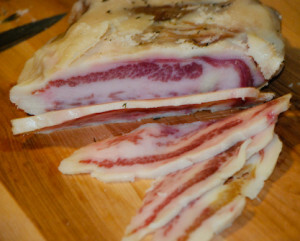 I have never had a chance to try Guanciale but I find it hard to think anything can be better than bacon. They suggest using Guanciale in place of bacon when cooking and that might work if youâ€™re making a salad, casserole, or even a burger but I would be interested to see how Guanciale holds up in a cupcake recipe. But who knows? I donâ€™t really like to pass judgment on a food before tasting it so maybe Guanciale is better than bacon and we should change the name of our website to Mr. Guancialepants. I highly doubt it though. Have a Nose Bleed? 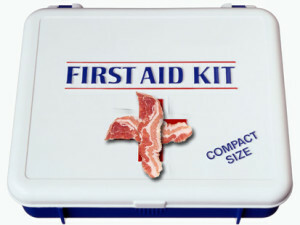 Bacon Can Help! We all know bacon is amazing. It tastes good, smells good, and even has the power to make the strictest of vegans knees buckle but did you know that it also has the ability to save peopleâ€™s lives. Thatâ€™s right those beautifully crisped up rashers sitting next to your eggs just might be a medical miracle. Those of us that love bacon have seen story after story about how bacon is going to kill us so itâ€™s about time we look at the benefits of this cured pork product. There is a rare disorder called Glanzmann Thrombasthenia that can result in life threatening hemorrhage particularly from the nasal vaults. In laymenâ€™s terms that means your nose will start bleeding and wonâ€™t stop until youâ€™re dead. But there is new hope for those out there those that suffer with this horrible disorder and the hope comes in the form of, you guessed it, bacon. Some Doctors have discovered that by packing the nasal cavity with cured pork via a kind of bacon tampon the bleeding stops. Twice a 4 year old child that suffered from Glanzmann Thrombasthenia was admitted to the emergency room with a life endangering nose bleed and twice doctors treated the child with the pork up the nose method. Both times the bleeding stopped within 24 hours and the child was discharged within 72 hours after the treatment. This is a huge breakthrough in the medical/bacon world and to think if some people (like health nuts, vegans, and some government officials) had their way we wouldnâ€™t even have bacon and that 4 year old child could have died. Iâ€™ve said it before and Iâ€™ll say it again, bacon truly is the most amazing food on the planet. It goes with everything pancakes, chocolate, burgers, and life. 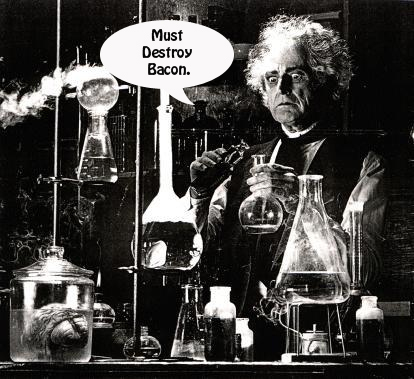 Why Does Science Hate Bacon? Why does science always try to take away everything we love? Any time people start enjoying their life by eating a Bacon Cheese Burger, doing recreational drugs, or burning old car tires in my back yard just to see how much smoke I can make, science comes along and throws some kind of study in my face telling us to stop doing everything fun. I found a bunch of news websites reporting that a new study is showing eating bacon will increase your chances at getting pancreatic cancer by 19%. Now whether or not this is true is not the reason Iâ€™m upset about this issue. The thing that is really ticking me off it the way itâ€™s being reported. First off, every website is calling this a new study. Well I seem to remember reading this exact same thing a couple months ago. In fact itâ€™s like every 5 or 6 months a â€œnew studyâ€ comes out telling us that bacon is going to give us cancer. Either news outlets just rehash this story on slow news days or a lot of money is being wasted doing the same study over and over again. We get it, Bacon is less healthy then broccoli so why donâ€™t you scientists turn your attention to something meaningful like creating a car that gets 100mpg or figuring out why Jimmy Fallon is still on television? This attack on bacon is very miss leading. Realistically what processed meat is eaten the most? I would make the claim that lunch meat is the most consumed processed meat. Sure people enjoy some bacon with breakfast but in todayâ€™s fast paced world most people only get time to cook bacon on the weekends but lunch meat might get consumed everyday. Itâ€™s quick and easy to throw sliced turkey on bread and head out the door lunch in hand. That is the entire point of lunch meat; they even put the word lunch in the name. I know people that eat lunch meat sandwiches every day for lunch and although they donâ€™t claim itâ€™s healthy eating they might not realize the risk. By using bacon in their headlines to grab peopleâ€™s attention then just barley mentioning that itâ€™s really all processed meats these reporters are keeping people in the dark about the dangers of their roast beef hoagie. Does this mean you should stop eating all processed meats ,move to an eco friendly farm, and start calling yourself Starchild Moonface? Of coarse not. Once again it all comes down just common sense. Instead of swinging by McDonalds every morning and pounding down McGriddles try some fruit or yogurt every once and a while. Itâ€™s really that simple. Jason Mosley (aka Mr. Baconpants) is the king of all bacon. He started this blog in 2004 to share his love of bacon and beer. Sean Brett (aka Bacon Knight) is the amazing co-host of Bacon Live, the weekly audio/video podcast about bacon and more. Beth Mosley (aka Mrs. Baconpants) is a lover of good food and beer. She enjoys cooking and trying new recipes (with bacon).